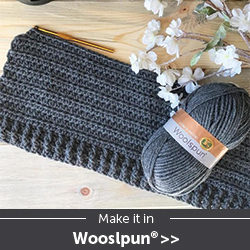 This lacy crochet blanket made of rows of tilted clusters is perfect for your next stashbuster project! 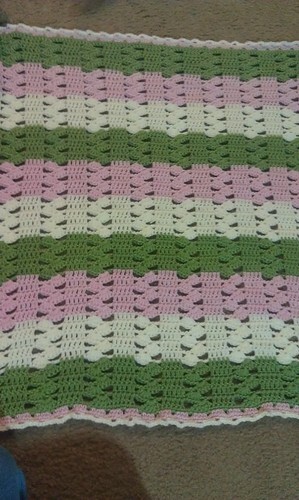 The lacy spacing between the crochet stitches goes great in Summer for your little one! 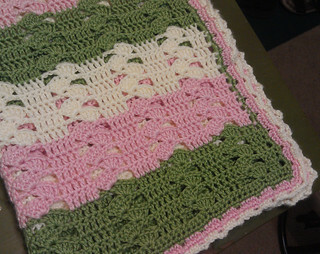 Baby pink, sage green and a soft cream come together to make a delightful crochet baby blanket. I may have put too many stitches on the sides because it made for a ruffled border, which is fine because I think it looks cute that way! The pattern is quite easy! Gauge: 1 pattern repeat = 3"
Finished Size: 27" x 32"
Like my patterns? Please donate to this starving artist! A new photo to add! When you finish with Row 3 do you continue doing row 3 till your desired length or do you start with Row 2 ? Good catch Penne! Yes, row 3 is the repeat row for the rest of the pattern. I love that my visitors keep me on my toes! I thought for sure I had added the multiples information. So sorry Tracey! It's multiple of 12 plus 4 for base chain! Tracy I'm making a scarf and I did 200 single crochet, so maybe that would also work for an afghan. If row 3 is used to complete pattern how do you sk ch2sp in remainder of rows. There's not a ch2 in row 3 to skip? I love this but am making for older people as lap robes I think a baby would get caught in it maybe not but with the large spaces their feet or hands could get cauight.but a beautiful pattern like this is sure enjoyed by the seniors! This may be a dumb question, but I am learning to crochet. At the end of the 2nd row, are you supposed to crochet 4 DC in EACH of the last 3 sc? Yes, it's a dc in each of the last 3 sc, keeping with the pattern you see throughout the row. I have the same question and I'm not a beginner. I keep on reading the pattern over and over and I just don't get it. Please explain, I would love to make this blanket!! Do you add 2 ch in between the 4dc in the last 3sc on row 2? Also are we working in the round? Something just isn't quite right. I am ending up wit a rounded edge following the directions both attempting to work in the round and turning. Please advise! Only thing worked in the round is the border after you're all finished. No, you don't add ch2. You want it to look just like the rows above and below it. Very pretty blanket and I have bookmarked the pattern for future use. TFS! I HEART your Lacy Baby afghan. I can't wait to purchase some yarn and get started on her. Unfortunately right now we are packing up the house and getting ready to move. Hubby says it's not a good time to buy MORE yarn. BooHoo! I'll be starting this as soon as my crochet chair is in place in the new location. Such a BEAUTIFUL blanket you created and your color choices are stunning. Love this pattern, but since I am running low on yarn I decided to make a scarf doing 2oo single crochet instead of 100. It is looking so good and I had no problems with the pattern. thanks! 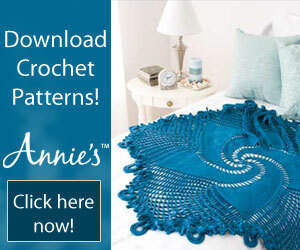 I'm in the middle of crocheting this pattern. The person who posted the pattern crocheted it in panels of 66 chs each panel. I decided to ch 132, and used Red Heart soft white for 12 rows, and 12 rows of pale yellow, topped with 12 rows of soft white. Can't wait to complete it for a person who does not know it's coming. Would love to see a pic when you're done if you can. It sounds pretty. Finished this this past weekend. It turned out beautiful. It was quick and I can't wait to try several more in different color combinations. 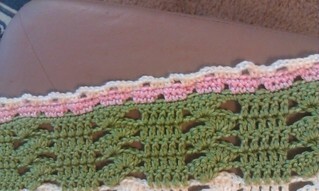 I used a single shell/scallop for the border. I am just starting this pattern... which I love for my soon to arrive great niece. I am having a problem with the 4 SC that are skipped in the 2nd row. I am following the pattern but the edge doesn't lay flat or stay straight because of the skipped 4 stitches. Wondering why 4 stitches are skipped and not, say, two. Thanks for trying out one of my patterns! As for your question, it is correct to skip 4 sc. Remember that before you made the shell, you didn't chain any- you just skipped 2 sc which the first 2 dc of the shell take up that space. After the shell, you are chaining 2, which takes up those extra 2 sc you're skipping. Thank you for making this pattern! What is your email? I'd like to send you a picture of mine that I made from your pattern. I made this for a friend's grandaughter and it turned out really pretty. They were thrilled. I believe that you * sk ch2sp before the 5 dc in the first dc of shell. Greetings! I thought I had updated the Stitch Key for this pattern, apparently I missed it! Thanks for the catch! 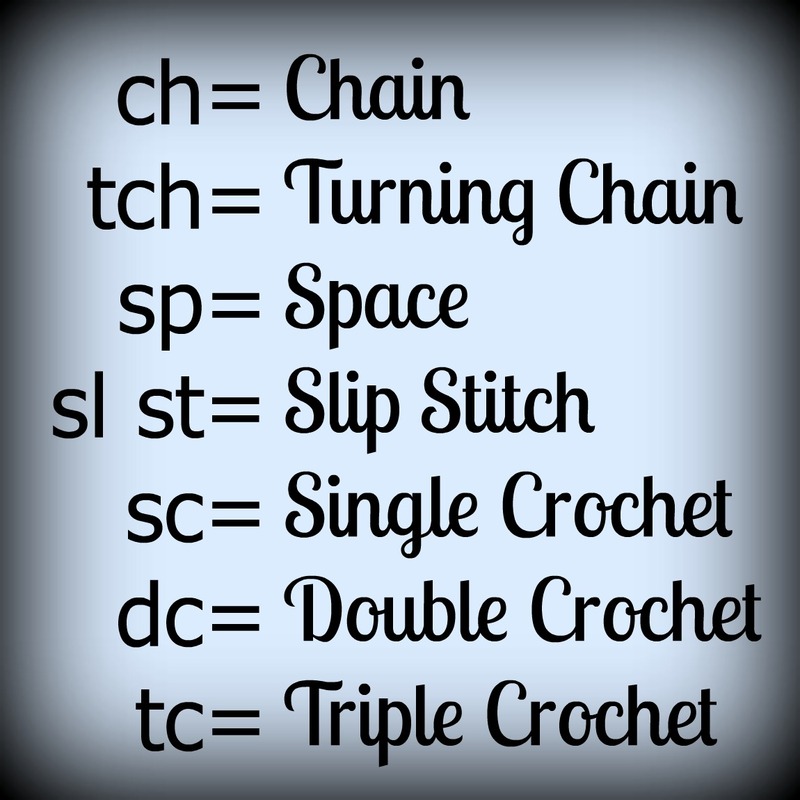 I added the stitch key today, hope this helps! Right at the end of the pattern. It's a text graphic. Hi There! If you repeat Row 3 til you've reached your desired length, then why is there a "4th" row? Hope to hear from you soon, as I would like to make a baby blanket for a girl who's due in Dec.
Hope that helps and happy hooking! I don't understand the beginning of the border where you mention what looks to me like a math problem. Add up 1 side, subtract 3 then divide by 4? I am so confused by what this means, do I just start with row 1 or so I have to do the math problem stitches first? And if so, what? Lol, I've done the bulk of the pattern and just can't figure out the border! Thank you in advance! It says the border needs to equal a multiple of 4 in order to do the stitch pattern properly. Then add 3. Just like with any blanket you begin that's a custom size, you chain a multiple and sometimes add a few more stitches, this one is 4 + 3. So, to get each edge the right multiple for the border pattern, do sc down it from either end. Then add them up and see if they are a multiple of 4. You will have to edit the count to equal the 4 plus additional 3. Otherwise, just do a simple border. 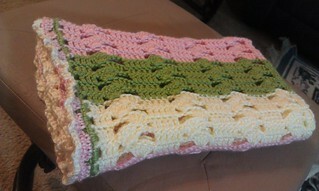 I was browsing for a cute baby blanket to make and came across this pattern which I think is quite nice. I am trying to make it but I'm stuck on the beginning of row 3. After 5 doubles in the first shell stitch it says to do 1 dbl crochet in each of the next 5 doubles but there's only 4 doubles left in the shell. 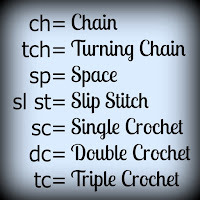 Can you please let me know where I start the 5 single crochets? I would appreciate it. Thank you! In the row 3 instructions, it says to put 5 dc in 1st dc of the shell. Then it says to ch 2, next, it says 1 dc in next 5 dc. While the pattern doesn't say to skip the rest of the shell, using the photos as a guide, the next 5 dc go into the 5 dc in the previous row. Thank you so much and not sure why it says anonymous when I was logged in. I think I've got it figured out so thank you - can't wait to finish and i joined your fb group.